not really. You will know it has stopped when sea level stops rising. remember. The global temperature does not exist. It’s a construct or index comprised of averaging SST ( from the first meter) and Air tempererage over land. When you combine those two you really dont have a physical metric that makes sense, you have an index of sorts that you can track historically. You’ll know the planet has stopped warming when the sea level stops rising. I wonder if the latest IPCC report is forcing the fake skeptics to speak up and say where they stand on the subject of climate change? Maybe some of them are shifting their position. Some of them, like Anthony Watts, are hardening their anti-science stance. Other deniers are allowing that maybe humans are causing global warming after all, but only a little bit. Maybe we can do a chart, something like this. It's only two dimensional so only includes groups that accept the climate is changing. It doesn't have a category for no change in the climate - except slap bang in the middle (neither warming nor cooling). 1 and 2 would be the scientists and people who accept science. They attribute most or all global warming to human activities but have different ideas on how hot it's getting. 3 would be normal deniers who accept that humans are having some effect although they don't accept science. They try to claim that a fair proportion of the change is "natural". They don't accept that earth is heating up very much. 4 and 5 also think that humans are having some effect but not as much as those in group 3. Some of them (5) think the earth is cooling while some (6) agree it's warming a little bit. 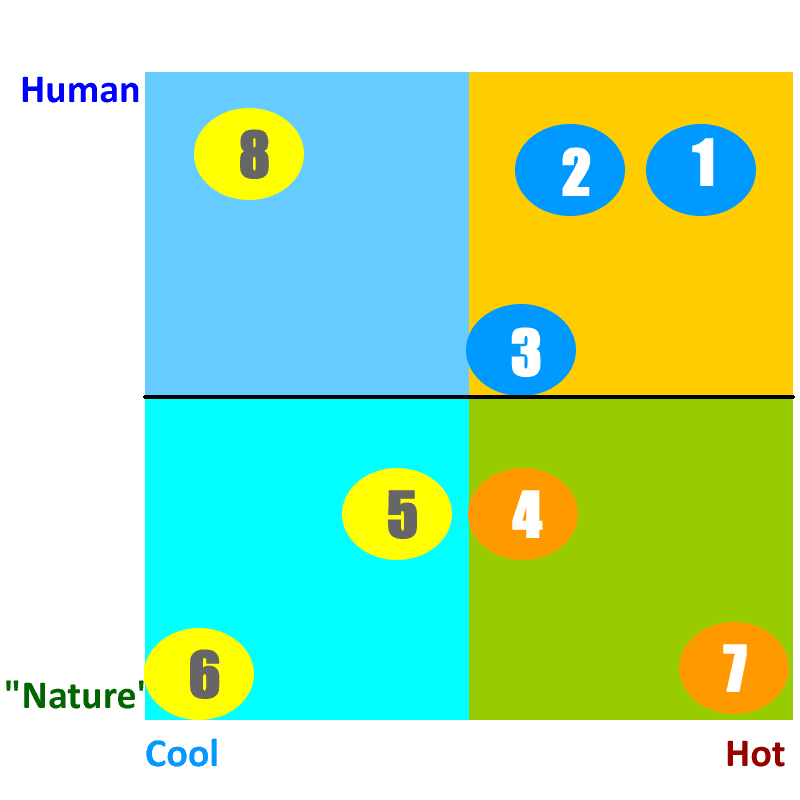 6 are people who think that it's "all natural" and we're heading for an ice age. I don't know of anyone who'd fit in group 7 or 8. 7 would include anyone who thinks the world is getting very hot but it's got nothing to do with human activity. 8 would be anyone who thinks all climate change is human-caused but think the world is heading for an ice age. I'd say Anthony Watts is in group 3 heading downwards, or making out he is. He pitches his blog to pander to people in groups 4, 5 and 6. Steven Mosher, Judith Curry and various other "lukewarmers" are probably around group 2 or maybe edging toward group 3. That is the spirit. You're either with us or against us. Acknowledging that there is natural variability already makes you a warmist? An enemy science fan? Oh my. "You will know it has stopped when sea level stops rising." What Mosher says here is something very obvious, even trivial. If sea levels are rising, it must be due to (1) thermal expansion and/or (2) melting ice. Both means that it is warming. To satisfy Willard, one must obviously deny the bloody obvious. It's getting more exciting than that fake wrestling with The Rock and John Cena. Perhaps the winner will get to wear an enormous belt. "Are there any warmists here today?" Well, he did say "sea level rise". IMO, a third axis is missing: the conspiray beliefs. Many among the lukewarmer blogosphere, not so far from the scientific point of view, are nevertheless fond of dubious stories about malfeasant "corrupted" mainstream scientists and are very happy to promote any new bashing campaign; sometimes they are even at its origin. It really is like the blind leading the blind. I see it as Anthony trying to keep control, blowing a dog whistle. But he has about as much control over people like Steven Mosher as he has over his self-appointed WUWT guard dogs like Smokey/dbstealey and richardscourtney. What about the people who say they accept AGW but not CAGW? I find this group particularly perplexing and it's my view that they've realised they were wrong (they were previously in group 6) but they don't want to concede too much ground so they've added the word catastrophic just to make their position look different. There's AGW proper as accepted by scientists, in which man is a leading warming influence on modern climate. Then there's "man only has a tiny warming effect" AGW, which might as well be no-AGW. Many of those who claim to accept AGW are hiding the fact they mean the latter case. They aren't really conceding ground, they are just relabeling the map so they can go on a CAGW strawman offensive. "Catastrophic" provides an easy get-out, of course. However bad it might get, however disastrous even, they can still claim it's not catastrophic like "they" said it would be. I have found that people who do claim not to accept CAGW (I even had to look it up to see what it meant!) shift their position quite regularly, although only slightly, so it's hard to know where they stand. Why can't they just admit they were wrong? What's so bad about being wrong? Or even admit that you're unsure? I shift my position on many topics quite often. The shift is caused by learning facts and/or integrating what I learn with what I already knew. For example in recent weeks I've concluded there are multiple positions (as shown on the squares graph). Therefore there are multiple levels of debate. Reading over the IPCC report contents I came to the realization that the debate is a bit about science but it has a large political content. Given the tendency towards polarization in today's media, it looks as if armies are arrayed in a political battlefield with multle fronts. Because of my training I've always used sea level rise as a key indicator, and when sea level dropped a couple of years ago I started to think the world had to be cooling. But then it started to rise again, so I guess we do have to worry, it seems to be warming and so on and so forth. "I've always used sea level rise as a key indicator, and when sea level dropped a couple of years ago I started to think the world had to be cooling. But then it started to rise again, so I guess we do have to worry, it seems to be warming"
Here is a tip Fernando - look at all the evidence. And your "conspiracy theory" about the creation of the RCPs which you are currently pushing at the <a href="http://www.theguardian.com/environment/climate-consensus-97-per-cent/2013/oct/11/climate-change-political-media-ipcc-coverage:>Guardian </a> is downright weird. Are you planning on giving that an outing here? One of the key factors why the sea level rise stalled a few years ago was that so much rain fell during 2011 - 2012 that a lot of the water was temporarily sequestered on land. Remember: Colombia, Pakistan, Germany, Queensland, Thailand, etc. I found a cite for an attribution for that somewhere, but can't find it at the moment. Kind of ironic, isn't it? Changing weather patterns/severity due to AGW (air holds 4% - 5% more moisture per every 1C temp increase) happens right under the noses of the AGW deniers, and they can't even see it through the blinders of their ideology. Thanks to the Republican-engineered shutdown, the original NASA sources are blocked off but there's a repost of the press release at SkS. There's a follow-up SkS piece here. scientific literature. It is not part of the theory of global warming. Which is already clear because if people would act (or would have acted) soon enough, there would be no large problems. More formally, climate change is another stressor, but without other factors, does not cause catastrophes. Thus such people can be anything from 1 to 6. Let's say they support the IPCC, but not Greenpeace or Thom Hartmann. Maybe next time you meet such a person maybe you could ask if he is fan of the IPCC. I already know what the answer will be with regards to the IPCC question, it will be no. But next time someone says this I will point out that there is no reference to CAGW in the scientific literature. The word catastrophic is fairly subjective too. A bit off topic (sorry Sou) but I want to ask Victor something. My resident "ostrich", as you call them, has asked for my view on the recent Mora paper about climate departure. I can't find any credible criticism of it (even Judith Curry seems to accept it) but it is rather alarming. What are your thoughts? The "Mora paper" in Nature has two problems. One is the use of data as far back as 1860 to establish a baseline. Evidently nobody alive today or who will be alive in 2060 would have much awareness of the climate as it existed so many years ago. I would have used a more reasonable range, say the last 50 years, to set the baseline. The other objection I have is the use of RCP8.5 as a "business as usual" case. That case is quite unrealistic in several areas, for example it assumes a very high human population, high GDP growth, and enormous use of oil which isn't really feasible. The figures just lack internal consistency because a very hot world doesn't lead to abnormal pulation growth, a booming economy and oil consumption so much higher than today's. I think they forgot the system is self correcting and the world economy would collapse, population would drop and there wouldn't be money to buy vehicles to burn that oil. And so on and so forth. Bummer about the ostriches, but I guess every still understands the term. Does your resident ostrich have any specific questions? Just scanning the abstract, I see nothing controversial. If ostrich is wrong, how about "climatologically challenged people"? It's really quite astonishing that one week they can predict global warming and just a couple of weeks later it's apocalypse thanks to global warming. I think Ostrich is better even if it's not completely accurate. As you say, people still understand what is meant. Oops, I meant to write that one week it's global *cooling* and then a couple of weeks later it's global warming. Probably no surprise, just look at the column to the right of the article, there is not much relationship between the Daily Mail article and the scientific paper. Especially the alarmist introduction. A tip for those that find it hard to read scientific articles. Just search for some of the key words: Apocalypse, uninhabitable, fight to survive, doomsday clock is ticking, global warming refugees pour illegally across borders. Then you will find that this is just in the mind of the journalist. The paper uses two scenarios, not just the RCP8.5 one. Using such a scenario is good to be able to compare studies with each other. Already for that reason, I feel it is a bit exaggerated to dismiss any study that uses this scenario. I expect that the economists and environmental scientists who made these scenarios did their best to make something consistent. A scenario is not intended to be a prediction, if only because it is impossible to predict economic and political changes over such a time span. If anyone has a link/reference that shows that the RCP8.5 scenario is inconsistent and impossible, I would be interested. The paper is written by a biologist. He wants to compare the size of the trend, with the natural variability of the climate. It is the natural variability that life is evolved to cope with. Likely a similar argument holds for human infrastructure. Thus it is entirely appropriate to go back far in time. In fact, I would argue that it would have been great if the time series would have started much, much earlier, because evolution is slow. If you look at trends in physical units, °C per decade, you see the largest trend at high latitudes, especially in the Northern Hemisphere the trends are huge at the poles and much less near the equator. Now if you compare the size of the trends to the natural variability, as this article did, you get the reverse picture. Because the natural variability is larger at high latitudes and less near the equator, the trends relative to the variability are larger near the equator. This means that even while the trends are larger near the poles, the largest climate change impacts for ecosystems will probably be near the equator. The same likely holds for human infrastructure. Where a additional problem is that these countries are poorer and thus have less capabilities and reserves to adapt. Sheesh. Do you think the Daily Fail flip flops from one extreme to the other just so they can shoot themselves down in flames? I won't have time to pull their latest article apart at the moment, but have put it on my to do list. For now, let's just say that unprecedented ≠ apocolypse. Thanks so much for this Victor, that's great. I wasn't entirely sure that I understood this paper but it sounded scary. I think what Mora and his team have done is a great idea in terms of communicating the problem to the public and by phrasing it in a different way. So is it right to say that the once climate departure has arrived for a certain location, the minimum temperature for any future year will still be hotter than the hottest temperature for any year prior to 2005? "Do you think the Daily Fail flip flops from one extreme to the other just so they can shoot themselves down in flames?" they're just interested in page-hits. "omg we're all going to die from global warming" sells newspapers just as well as "omg climatologists are all liars" and "omg look at Britney's boobies". If only it was as simple as that. But it isn't the whole truth at all. The editor of the Daily Mail (Paul Dacre) is a right-wing, free-market fundamentalist ideologue with much in common with his good friend Lord Lawson. Lawson's climate misinformation machine (the GWPF) feeds distortions into the Daily Mail (and Mail on Sunday) with Dacre's connivance and blessing. The "special relationship" between Dacre, Lawson, the DM and the GWPF is detailed in this article which I urge you to read if you are a UK resident, taxpayer and voter. Or even just curious. The GWPF (funded by who knows because it refuses to disclose) is engaged in a war on democracy in the UK. The aim is to misinform the electorate and so facilitate certain types of policy at the expense of others. This is easier when you have misled the electorate into believing certain untruths. This suits the aims of what can reasonably be called an elite, or plutocracy. George Monbiot has more to say on this - and Dacre's role in it - which I also urge you to read if you have five minutes. "I don’t see how anybody can go to America, work there for six years and not be enthralled by the energy of the free market. America taught me the power of the free market, as opposed to the State, to improve the lives of the vast majority of ordinary people."